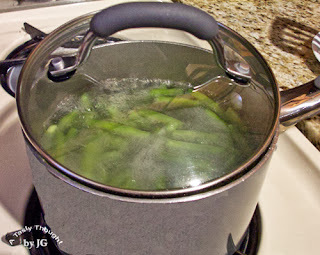 Green Beans simmering on my stove. At dinner time during the summer we enjoyed Green Beans purchased from our local Farmers' Market! They're a fave veggie, so I always purchased more than needed for a meal. The cooked, cooled extra Green Beans always found their place in a small bowl in our fridge - after about a Tablespoon of Light Italian Dressing had been poured over them (and the bowl was covered). The crispy green colored beans make a great side dish salad the next day. Now, this brings back memories for me - prepping 3 Bean Salad for summer picnics. With the colder weather just around the corner, I'll be using the frozen packaged purchased variety, soon, and will microwave it. The larger bag will give me a few extra for Marinated Green Beans! Do you purchase the fresh Green Beans when available? The Harvest Moon is now high in the night sky when we look up! Sunday Autumn arrives! What a great season! In a blink of an eye the leaves on our trees will change from green to majestic shades of yellow, orange, red & maroon. It's also the time of year when the fresh local apples can be picked at the nearby orchards or purchased at road side stands and Farmers' Markets. Ida Reds, Macintosh, Honey Crisp and also Cortland apples - so many choices. It's also the time of year when I bake Apple Bread. The aroma of this yummy "quick" golden colored dessert bread just floats from my kitchen as it bakes. The combo of Apples, Cinnamon, Nutmeg & Orange Juice is so good! I use Egg Whites & Olive Oil (for sauteing & baking) as substitutions for Whole Eggs & Vegetable Oil. 2 breads are baked at once. It's tradition - The 2nd bread has always been placed in the freezer - after it is cooled and wrapped in foil. It usually finds its way as a "gift" for a friend. Add Egg Whites (slightly beaten), Orange Juice and Oil and stir. Add chopped Apple and stir well. Spray PAM into two large loaf pans. when inserted in middle of loaf. After cooled, wrap in heavy-duty aluminum foil and enjoy later. 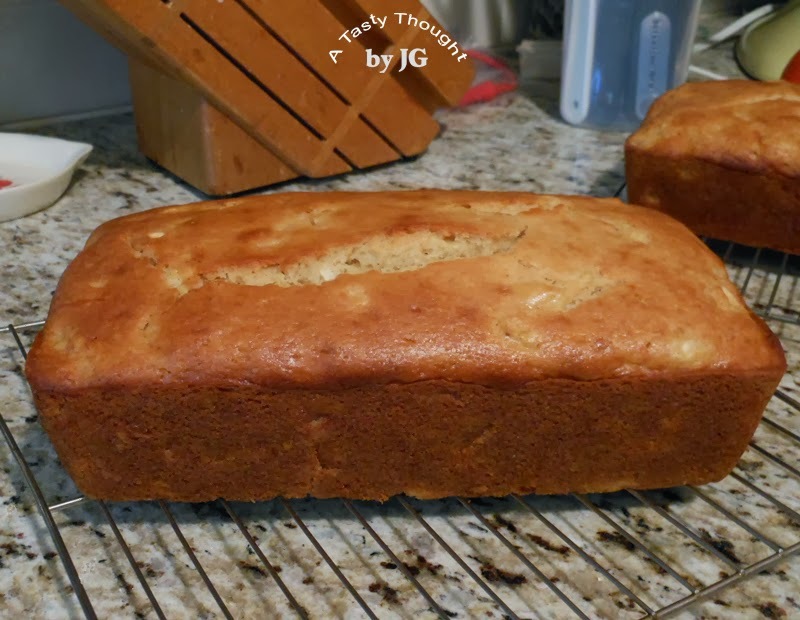 This yummy dessert "quick" bread freezes very well. It's also a yummy bread to enjoy at Thanksgiving! There was a definite chill in the air this AM! Frost is already mentioned for tonight! I guess it's time to pack away the comfy shorts and find those denim jeans. Yes, it is mid September and it's right on schedule, but I'd rather not admit it! While waking up to the cooler air, suddenly a bowl of creamy hot oatmeal came to mind. O.K., last week during the 94° F day this idea would not have been good. This AM = Yum! Craisin Creamy Oatmeal is filled with old fashioned oats and is my fave cereal. Adding those tasty dried cranberries to the oats along with Cinnamon, Nutmeg & Brown Sugar makes for a yummy, hearty breakfast! Soy Milk works well for me, and also for this hot cereal. 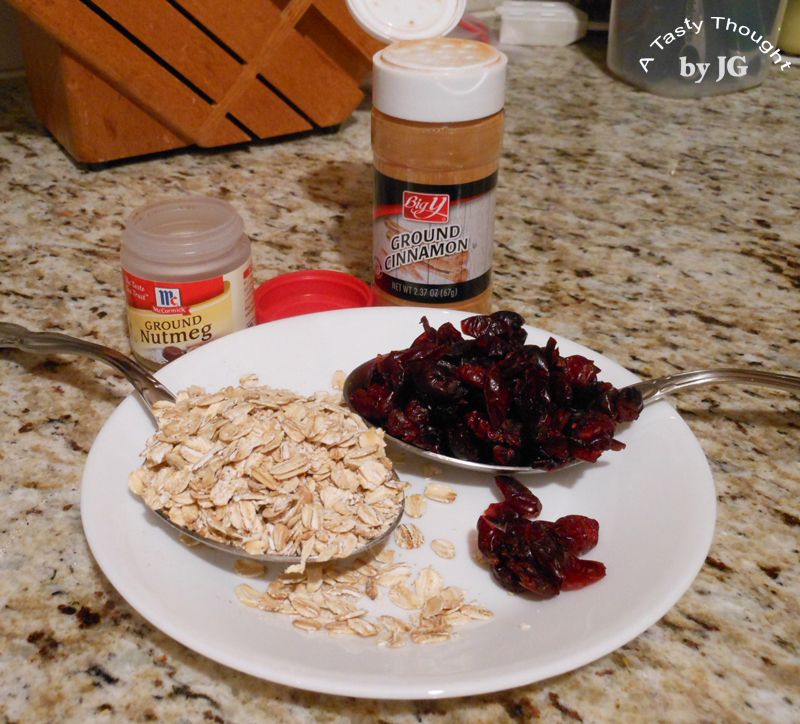 I follow the basic directions on the Quaker Old Fashioned Oats canister, then add a little magic! No Salt needed! 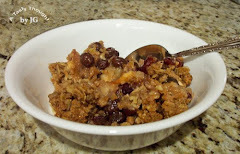 ***When the ingredients "sit" in the pot, the oats & Craisins soften resulting in creamy oatmeal. Fiber & Calcium at breakfast is the best! It's always fascinating to sample a new food - especially when visiting another area. Sometimes, I totally enjoy the taste... other times I'd probably pass on it, if it was a choice again. A couple of weeks ago, when we were in Philadelphia, we enjoyed staying at the Hyatt Regency at Penn's Landing, located near the historic district and also on the Delaware River! The hotel's restaurant had a tasty menu. We ordered a cup of soup to start with that evening. It had a simple name. 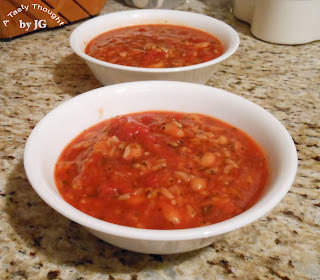 Yet, it also sounded so yummy - White Bean and Tomato Soup. A steaming cup of the tomato base soup was filled with Cannellini Beans (White Kidney Beans) and Basil. It did not take long to devour it or for me to decide that after we returned home I would use my Dutch Oven to prepare a batch. It was quite easy to decide what ingredients to use in this yummy soup. They are all staples in my kitchen! Rice is a great side dish with grilled fish, and the previous evening we enjoyed White Rice with Grilled Sockeye Salmon. The day I prepared this soup there was a bit of prepared "leftover" Rice to add to this very yummy soup. 1 can Tomatoes, drained - If using whole tomatoes, cut into eighths. Place all ingredients, except Cannelli Beans & Rice, in large pot or Dutch Oven. Drain Cannelli Beans & rinse in cold water, drain again. Add to other ingredients in Dutch Oven. Add previously cooked Rice & simmer 4- 5 minutes. After dinner, cool the remaining soup. Cover & refrigerate. ***If the Prepared Rice has been added, a small amount of water will need to be added when reheating the soup. The Rice absorbs the liquid. On a chilly cold evening, this easy to make Tomato Basil White Bean Soup will be a "go to" recipe for me. It's also so good with the "leftover" Rice added in.